Last week I had just come back from a short trip to London. The heat that started in April had continued to build through summer and the streets of the capital were running with sweat. I understand they lowered the Thames Barrier to control it. I got back to Cornwall as the weather changed, not with a crash of thunder but with a slow dankness like a leak in a hot water bottle. The chilling and the moisture have been welcome even without pyrotechnics. The garden has been split evenly between two stories. The herbaceous spectacle has moved into the final act, all pomp and fat ladies. In the greenhouse the bulbs that have been resting through the summer are twitching impatiently waiting for the stage. It is a compromise to try to tell both stories but that is the tone of the week. 'Andrea Atkinson' is the first of the Japanese Anemones to open. 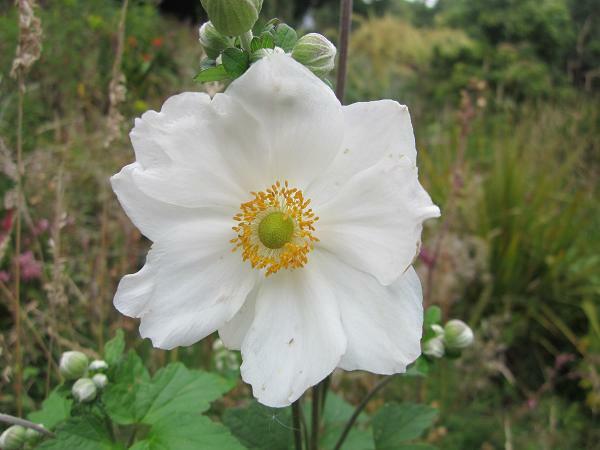 The flower is larger and fuller than 'Honorine Jobert' (most ancient of the line) and has the appeal of novelty. It carries the herbaceous display into the season of Buddleia and butterflies. I haven't been able to find out much about its history, though it wasn't mentioned by Piers Trehane in 'Index Hortensis' (1989) so I assume it is a more recent introduction. It seems to have that compact and pot worthy stance so essential if modern plants are to be distributed successfully. We all claim to enjoy large vigorous plants in the border but we only buy those that look good in a 12cm pot at the point of sale. The two attributes are not always compatible. Perhaps that is the real reason 'Honorine Jobert' has been displaced. Also displaced by 'Andrea Atkinson' is the first Nerine flower of the season. N. masoniorum opened yesterday, tiny pink promise of the floral cacophony to follow. 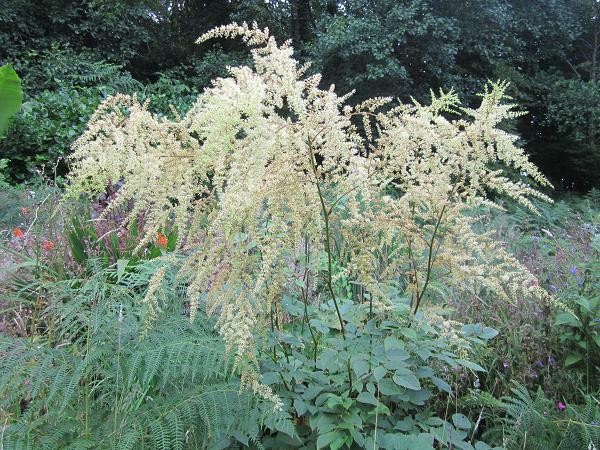 There is nothing subtle about Astilbe. They pretend there is, but it is a ruse to lure the unsuspecting into horticultural excess (I was lured long ago, too late for me). The foamy sprays of flowers pretend to the translucence of Verbena bonariensis in the garden, a gentle waft of colour waving in front of a larger view. Not a chance. Astilbe waft the sort of foamy flowers you could use to beat a carpet. 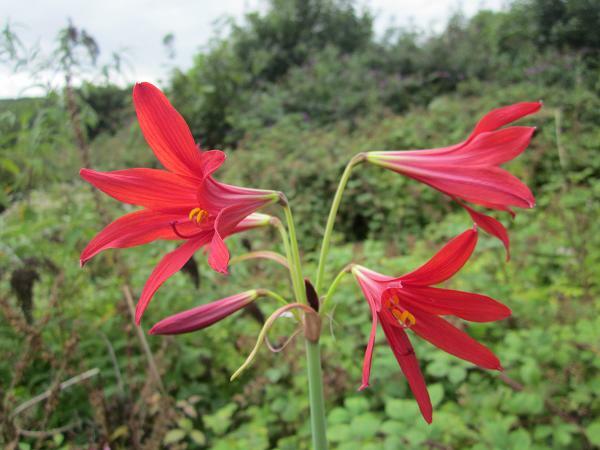 I started my association with the genus years ago, collecting up the various border cultivars that have occasionally threatened to become popular. Fortunately they have never quite managed respectable colours. The reds are tinged with sadness and the pinks have the complexion of human resources managers in large corporations. You may chat at lunchtime, but you wouldn't choose them for friends. They have been bred to emphasise the dwarf, as if to reduce their embarrassing impact in the border. For years I was happy with these little scraps of tastelessness but then I met the monsters of the genus, and I am overwhelmed. Astilbe rivularis var. myriantha came from Crug Farm Plants (BWJ 8076A), collected near Baoxing in China. It has towered over the autumn border. Crug suggest that 2m is possible, it has already exceeded that. The solid mass of foliage at the base anchors the tall plumes of flower which don't wave in the breeze, they thrash like a Whomping Willow on steel-strong stems. Outstanding. The bulbs have stopped resting. Those who cling to the liferaft of facts and brave the storms of chaos we call modern life will observe that nothing has changed in the greenhouse but I think they are wrong. Through the summer the Nerine (and many others) have been resting, content to lie in the sun and do a fair impression of onions tanning themselves for the pot. Things have changed. Like a pride of lions at dusk, they have stopped resting and started watching. There is purpose in their apparent idleness. Just below the surface, spikes are waiting to pounce. I have looked at the pots and wondered if it is time to start watering. I have even splashed a little moisture in their direction to wash the sleep from their faces. This Rhodophiala has been fast off the mark. The spike has developed over the last 10 days and there is a suggestion of some foliage to follow. Originally distributed by Harry Hay as the most reliable flowering plant in the genus (they are a bunch of cranky amaryllids) it has now adopted his name. I got it from Bob Brown who suggests it might be R. Granatiflora (an uncertain name) allied to R. bifida, a variable species from Argentina and Uraguay. The various species come from Chile, Argentina, Bolivia and Uraguay in summer-dry deserts. I have assumed this one will want a hot summer rest and moisture in autumn when it flowers and it seems to have worked. However before I congratulate myself on my talent I have to note that I also 'grow' R.pratensis and I'm not convinced it is either resting or watching. I think it might simply be dead. 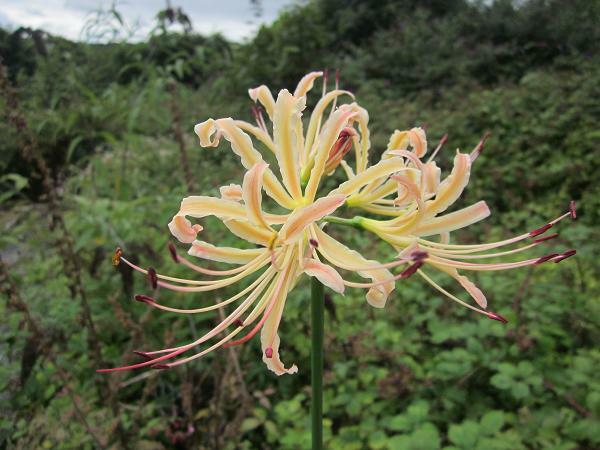 The Nerine are starting to move and that is to be expected, but flowers on a Lycoris are a distinct surprise. I bought this from China as a small bulb in 2007 and have been watching the pot with benign resignation ever since. It produces occasional leaves but my experience has been that the leaves never look sufficient to support any significant growth and the bulbs never flower. Recent postings from gardeners in Japan show them prospering and making bold floral statements through the autumn and it seems they need moisture and a lot of warmth in summer if they are to succeed. Last winter I changed the climate in the bulb house, closed off the ventilation and allowed temperatures to rise in the summer until it was unconfortable to be in there during the day. It is too soon to suggest that it is the cause of this flowering, it may never happen again, but it is a cheering sign. The species comes from China (Shaanxi, Sichuan) where the Flora of China describes it as growing on shady slopes but I am ignoring that, mostly on the grounds that my plant doesn't remotely match the published description (perianth white...stamens shorter than perianth..). If I was given to wild speculation I might suggest that this was a cultivated hybrid from a garden somewhere and that perhaps L. aurea and L. radiata had played a part, but whatever the identity I am happy. This is a distinct improvement on inadequate leaves.